Preheat your oven to 450° and line a baking tray with parchment paper. Sift the flour, baking powder and salt into a large bowl, add in the butter and with clean cold hands quickly mix the butter in. You want it to have the texture of cornmeal. Stir in the milk and quickly stir into a dough. 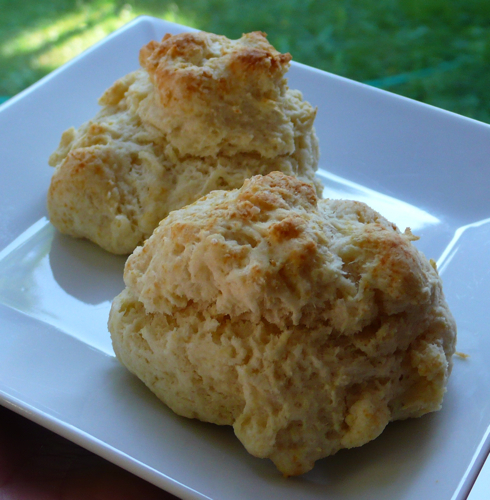 For drop biscuits scoop into 12 portions and place onto the baking sheet. For rolled biscuits turn the dough out onto a lightly floured board and knead gently for about 30 turns, then pat to 1/2″ thick and cut into 12 sections and proceed as before. Bake for 10 to 12 minutes or until golden brown on top.